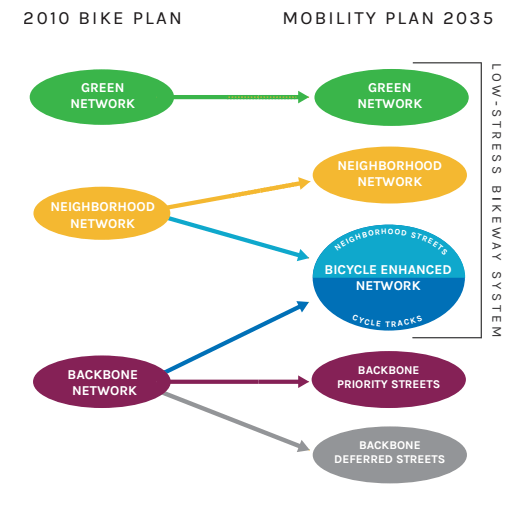 How Does LA City’s Mobility Plan Modify Its 3-Year-Old Bike Plan? LA City Planning Department graphic showing how the bike plan does and doesn’t become the Mobility Plan. From the DCP handout: Where did the Bicycle Plan go? Streetsblog readers are probably aware that the city of Los Angeles Department of City Planning (DCP) is currently updating the Transportation Element of the city’s General Plan. The Transportation Element has a great deal of influence over what L.A.’s streets look like, and which uses they prioritize. The new Transportation Element, called Mobility Plan 2035, has been released in draft form. For a plan overview, read SBLA’s Mobility Plan review, and also read SBLA’s series of Community Voices on the Mobility Plan: part one, two, and three. Read the plan documents and summaries at the DCP’s LA/2B website. DCP just concluded a series of community forums, but is still receiving public comment through May 13, 2014. In the past, the Transportation Element included a somewhat independent bike section, called the Bicycle Master Plan. In 2011, after much controversy and struggle, the city adopted its latest bike plan, titled the 2010 Bike Plan. That plan is currently in effect, governing what streets are approved for bike lanes, as well as a host of other bicycle related policies. A few components of the 2010 Bicycle Plan have been modified during the Plan’s integration into Mobility Plan 2035. These modifications were made in order to reflect the latest input from the community, as well as to reflect further refinements of the bikeway system. The details of the “few components [that] have been modified” are not entirely clear. Bike Plan facilities have been carried over into the new Mobility Plan, but there’s no clear thorough accounting of what’s in and what’s not in. DCP lists a category called “Deferred Backbone” (the gray oval in their chart above) of 195 miles of streets that were approved in 2011, but, in DCP’s designation, just won’t happen before 2035, so they’re out. The handout also states that the Neighborhood Network is “relatively unchanged.” Relatively unchanged never quite means a little more bikeway mileage. According to the stated totals, the Neighborhood Network appears to have lost 5 miles. The 2010 plan totals say there will be 825 miles of bikeways. The draft Mobility Plan shows a total of 820 miles: 50 miles in the Bicycle Enhanced Network (BEN) plus 770 miles in the remaining Neighborhood Network. Which 5 miles are missing? Or was new mileage added, and more than five deleted? It’s hard to tell. It’s a bit like finding a needle in a haystack. That’s all. There’s no indication of what the end-points are for any of these streets. Though this is described as a “corridor,” it includes two north-south couplets (four streets) and one east-west street. Some of the corridors are more clearly delineated than this, but, other than referring to a map, there’s no way to tell what bikeway starts and ends where, nor how long it is. The mobility plan does include total mileage. For example the new Bicycle Enhanced Network (BEN) totals “330 miles,” but there’s no listing of components that add up to that total. Perhaps the overall mileage was totaled on a piece of scratch paper, which was subsequently discarded. The same is true for the plan’s Transit Enhanced Network. It’s 240 miles long, but there’s no list of street segments with end points and distances. Unfortunately, in the past, when the city published totals with incomplete or inaccurate supporting data, bikeway mileage suffered. A 2009 bike plan draft stated that the plan included a total of 125 miles of bike lane, but, when C.I.C.L.E. added up the actual facilities listed, there were only 28 miles. In 2011, the L.A. Department of Transportation (LADOT) claimed to have implemented 55 miles of bike lanes, but the actual total was only 35 miles. The 2010 Bike Plan contains both facilities and programs. It appears that a lot of the programs approved in 2011 have been, in abridged form, incorporated into the Mobility Plan’s “Action Guide” (pages 132-153.) But, again, without reviewing these documents with a fine-toothed comb, it’s not clear what’s left in and what’s left out. The action plan appears to have fewer words, so the 2010 Bike Plan has been modified, abridged and/or edited. It appears that bicycle has been written out of bike plan programs, in favor of generic “all roadway user” type language. In doing this, a great deal of specificity from the Bike Plan has been lost. This is one example. It’s unclear what programs have been kept, modified, deleted, etc. What serves bicyclists best: a bicycle-specific master plan, or inclusion in a multi-modal transportation plan? Is it really necessary to invalidate the three-year-old Bike Plan in approving a new Transportation Element? When the 1999 Transportation Element was approved, it didn’t overwrite the 1996 Bike Plan. Could a new Transportation Element similarly merely add to the Bike Plan, and/or stand alongside it? Streetsblog L.A. is continuing to dig into the finer details of the draft Mobility Plan, but the opacity of the initial draft, especially in regards to facility specifics, doesn’t bode well. Thank you for raising this issue. I had questions about the incorporation of bike elements into the Mobility Plan and had assumed that the 2010 Bike Plan would not be replaced by this new, all-encompassing plan. The plan called for implementing 25% of the Transit-, Bicycle-, and Vehicle-Enhanced Networks every five years. At the time I read that, it seemed like a reasonable timeline for rolling out all elements of the Mobility Plan. But, looking at it in the context of the existing 2010 Bike Plan, is the bike component of the Mobility Plan an inadvertent (or possibly intentional) means to slow down implementation of the 2010 Bike Plan? Just seems like if the city can drag its feet on adding critical links in the bike network, it’s just fine doing that. The 2010 Bike Plan or Mobility Plan does not restrict the LADOT to only implementing bikeways on those streets listed. The LADOT bikeway traffic engineers can work on any of the streets in Los Angeles–per traffic engineer Tim Fremaux. Restrictions on where bike lanes are installed usually come from the council members or lack of enough street width. To illustrate where the LADOT traffic engineers have put in bike lanes that are not on the 2010 bike plan, look at the bicyclela.org bicycle map of the Wilmington area just east of San Pedro. Remove the check marks in the boxes below the map and then click on the 2010 bike plan bikeways box. Then click the existing bikeways box to see a large increase the number of bikeways compared to the 2010 bike plan. And finally click the box for the bikeways in development to see what they plan to install soon. This clearly shows that the streets that can get bikeways are not restricted to the 2010 bike plan, nor would the Mobility Plan do that either. A couple of other examples are Parthenia St and Burbank Blvd. Parthenia St is listed in the next group of 40 miles of priority streets that will have community outreach meetings. This 8.4 miles of Parthenia St is not on the bike plan. The obvious reason for its inclusion was that the bikeway engineers could not get bike lanes on Roscoe Blvd due to the volume of traffic. This is probably partially due to freeway on and off ramps for the 405. Burbank Blvd has had miles of bike lanes installed since 2011 and yet this is not on the bike plan. A likely reason for that is that Mayor Villaraigosa’s had a goal to install more bike lanes under his two terms than all his predecessors combined. To accomplish that the DOT staff were told by manager Jaime De La Vega to look beyond the bike plan to make it easier to find places to install bike lanes. The end result was that the DOT installed 151 miles of bike lanes in the last two fiscal years. This is well beyond the goal of 40 miles of bikeway installations per year under the 2010 bike plan. One of the reasons for only 181 miles in the bicycle enhanced network (BEN) of the mobility plan is to focus the limited number of staff to those streets. Most of those streets will require time consuming public meetings before installation of bike lanes. That’s per Claire Bowen of the planning department. Most of the things you seem to be criticizing here seem quite reasonable. The 2010 bike plan was a 35-year plan, so nearly a third of it stretches beyond 2035. If only 195 miles of the plan have been removed, and the plan is to be implemented by 2035, then this is actually an acceleration of the bike plan, not a reduction of it. As for the lack of specific street segments, again this seems reasonable. Until the planners have actually done a detailed local study, it’s often premature to list exactly which streets will be involved in a piece of infrastructure. With Figueroa/Flower, 7th, and Spring/Main it should be easy to list exactly which segments, but for something like the Edgemont/Heliotrope/New Hampshire/Budlong facility paralleling Vermont Ave, there are a lot of possibilities for exactly where the facility should move from one street to another. I suppose that listing specific segments could help people check that the distances really are close to the listed amount. But of course, it’s really the amount of connectivity gained that matters, not the total mileage of streets striped. The point about officer training is, however, a serious one. That needs to be fixed. I agree that there should be flexibility in deciding what’s ultimately best in a given corridor – there always is (no city goes out and implements bike plans wholesale as approved), but I don’t think that lets DCP off the hook. If they’re going to publish a total, they should be able to back it up with what they added to get that total. About two years ago LADOT came to our neighborhood council with a plan to widen a portion of Bundy above Santa Monica. Despite the recent passage of the complete streets initiative, this plan for Bundy ignored both complete streets and the then nearly approved bicycle master plan. There was no consideration by DOT for uses of Bundy aside from placing as many cars on it as possible. There was no concern for controling speeds and safety at non-peak hours. Their idea was roundly trounced by the residents. Last month LADOT comes back to us with another plan for Bundy, this time below Santa Monica and as a part of the ‘Mobility Plan.’ Again, the bicycle master plan is ignorned (now approved) and the complete streets idea is completely ignored. What we have is a 7-lane freeway being proposed right in the middle of our community. There are no medians, no greenery, no accomodation for safety, no pedestrian enhancements to improve walkability and no mechanism to reduce speeds at non-peak hours. The supposed planners who presented this ridiculous idea that completely ignored what the community had told them less than two years prior acted as if community suggestions were no longer valid in the face of the Mobility Plan. At least in the Bundy case they have ignored planning facts that have been established in other, more refined cities. These planners actually said that they would consider bike infrastructure and pedestrian friendly scape once such activities increased! This demonstrates a complete lack of knowledge on their part of how to actually go about increasing alternative mobility features. They once again proposed a car-centric plan ignoring the safety and liveability of the surrounding residents. I should also point out that California endorsed the NACTO Urban Streets Design Guide last week. I hope that as the state becomes a bit more progressive with regard to transportation, this may trickle down to LA. If the remainder of the Mobility Plan is more of the same, then Los Angeles clearly continues to keep its head in the sand and willfully ignore established planning ideas that could make this a truly great city, not just a city we put up with because the weather is great. Here we go again: planned but unfeasible is now deferred backbone.